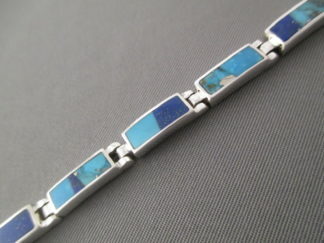 Bisbee Turquoise Cuff Bracelet by Leonard Nez! Beautiful sterling silver cuff bracelet featuring a lovely Bisbee Turquoise centerpiece stone and fantastic silver-work. VERY attractive turquoise jewelry by award-winning Native American (Navajo) jewelry artist, Leonard Nez. Unique and STUNNING!